If there’s anything that I love about the creative process, it’s that it can change or manifest at any point. It’s also especially interesting how an item or element can spark zero ideas one day and 931298 ideas the next. 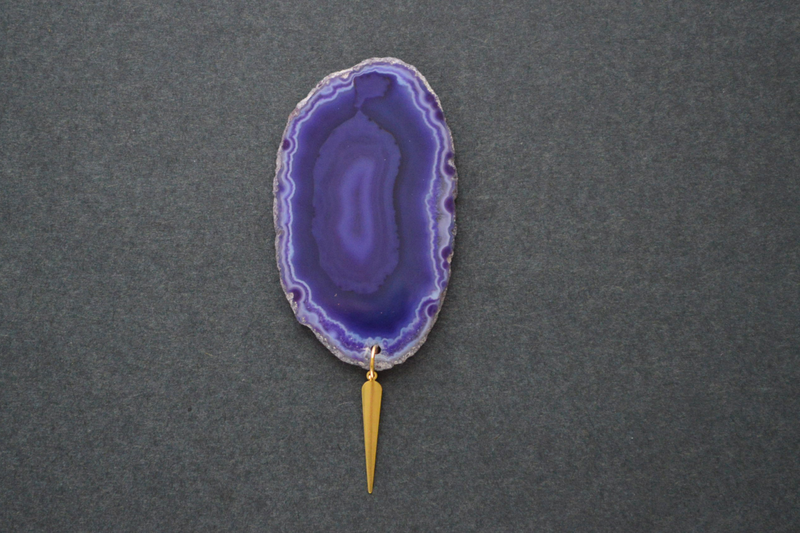 This oversized agate pendant is a prime example. I’ve had this little guy for a while. A few years ago, I purchased a batch of agate pendants to make a few dainty necklaces. Most of them were the perfect size for jewelry I was going for.. except this one. At more than 2 inches long, it was a bit hefty for the style I wanted. It’s been sitting in my stash ever since. I had no idea what to do it. But when I recently snagged this black night light socket from Darice, an idea was suddenly born. Finally. 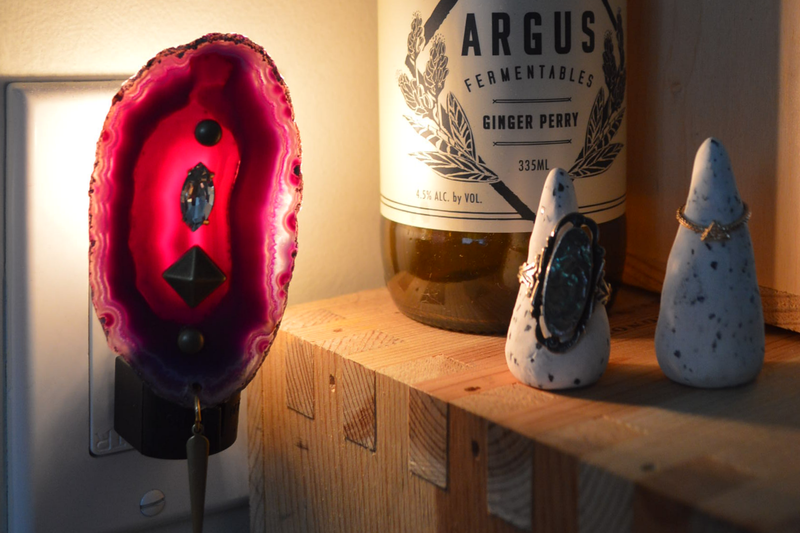 The night light base that I used is by Darice Crafts. Check out the lighting section at your local craft store to find similar fixtures. 1. 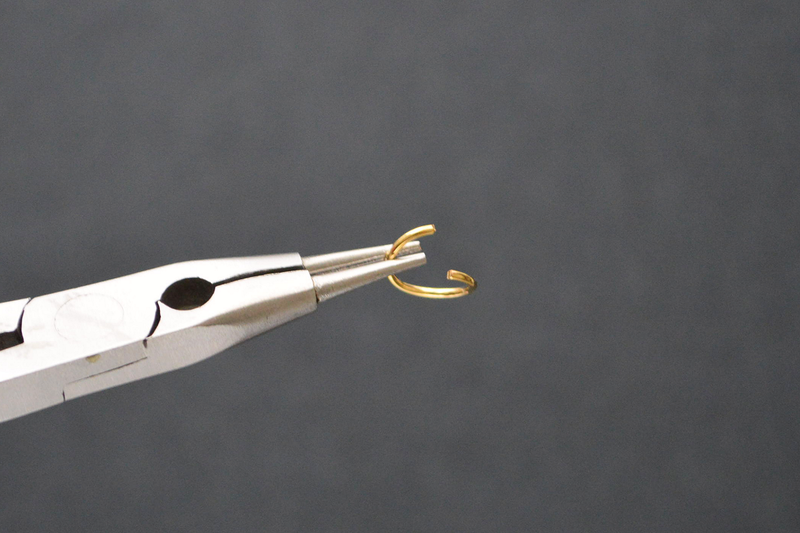 Using the jewelry pliers, open up a jump ring. 2. Add the charm and agate pendant to the jump ring. 3. Close the jump ring. 4. 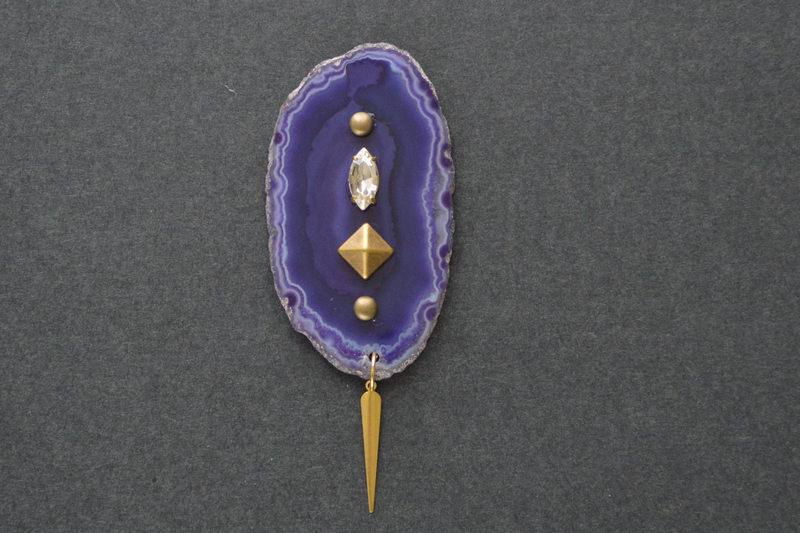 Glue your medley of rhinestones and/or studs to the agate. I used a marquis-shaped rhinestone, two flat-backed dome studs (technically iron on) and a flat-backed pyramid stud. All of these were leftover from past projects. Remember, the charm should be on the bottom. 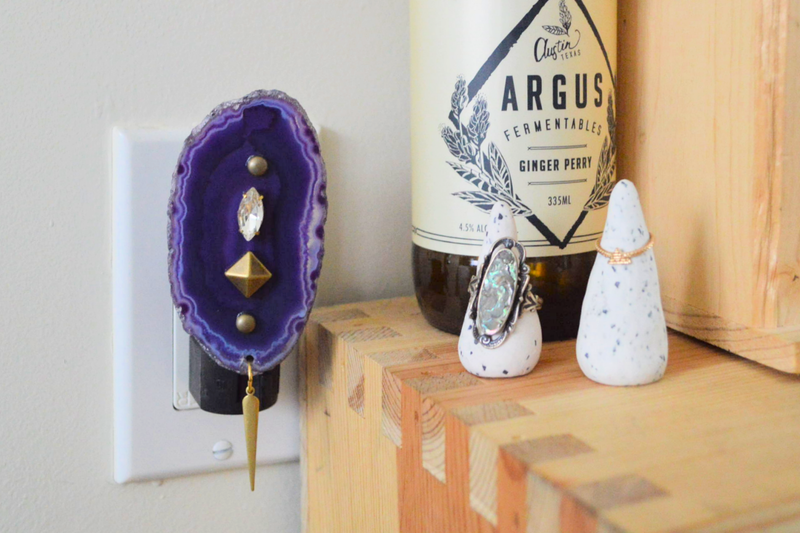 The agate pendant is technically being used upside down. 5. 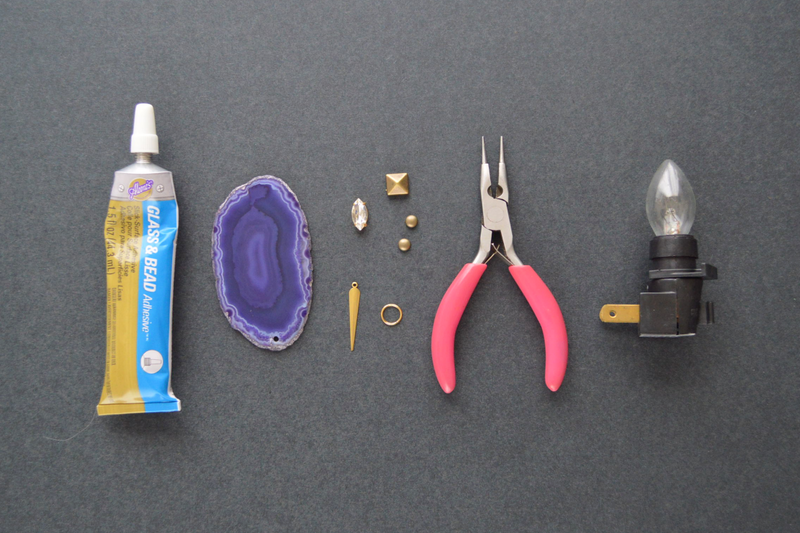 Glue the flat sides of the night light fixture to the back of the agate pendant. 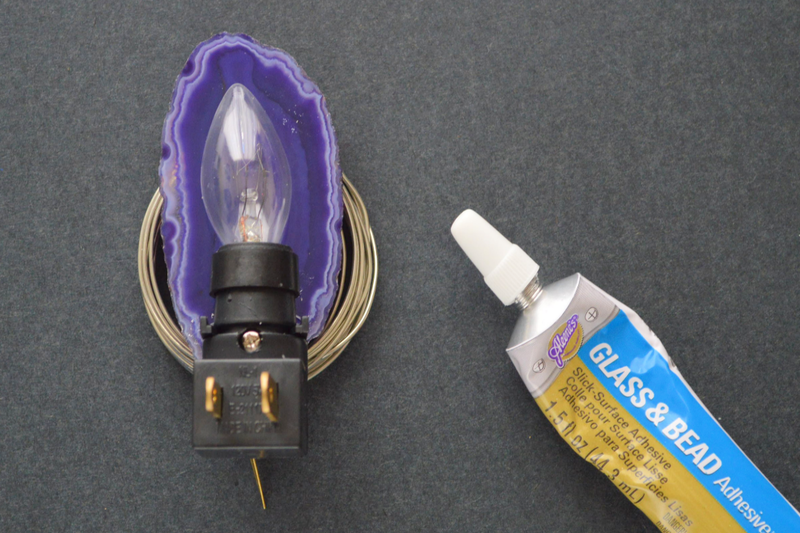 The embellishments on the front side may make it hard for the agate stone to lay flat; this is where a spool of wire or jar lid comes into handy. 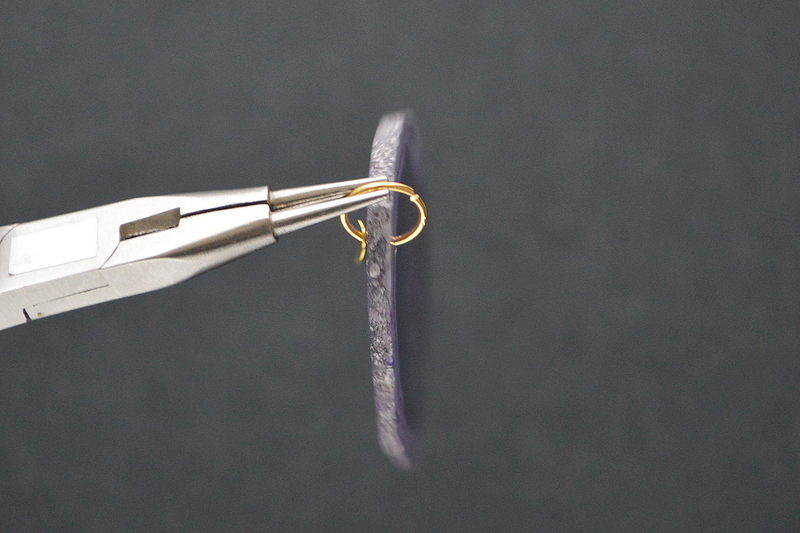 Simply lean the agate on the spool/lid so that it lays flat. … and light up your pretty little creation. Admittedly, I think I like the night light more when it’s off during the day time. But I’m into it either way. Hope you love it!